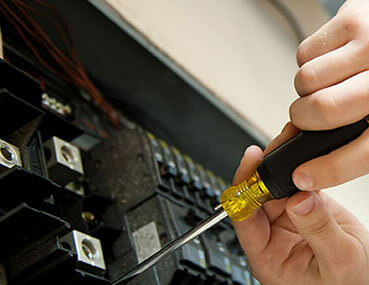 At Deer Creek Electric, we are the “Service Upgrade Specialists”. We perform more electric service upgrades than any other service we provide! (sometimes up to 3 per week) We’ve replaced literally hundreds of electric services since our company’s inception in 1992. Because of our vast experience, we have witnessed just about every circumstance and situation imaginable. With ever-changing electrical codes, combined with challenging existing electric service installations, it can be very difficult to design and install the perfect system for your unique application. This is where experience matters! You can trust D.C.E. 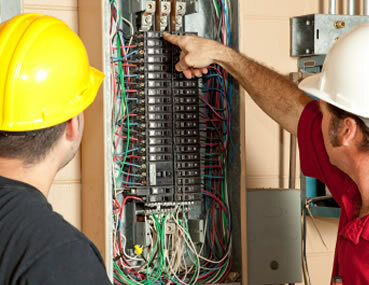 to design and install the right solution for your electric service upgrade. That’s why we say at Deer Creek Electric…. “The Buck Stops Here”. What things should I look for in my existing service to determine if I need my service upgraded? This is the #1 problem we find that damages many electric services. 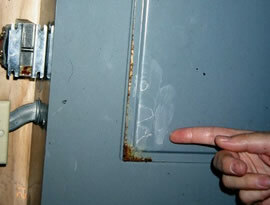 Many times, the UV rays from the sun will break down the exterior service entrance cable jacket, causing it to crack. Also, an improperly installed service head or improperly sealed connections can cause serious damage. These will allow rain water to enter the cable assembly. The service entrance cable then acts like a conduit by channeling the water into your breaker box and right across your breakers, causing them to rust and corrode. These corroded and rusty connections eventually will start to arc and spark. We’ve even seen fires as a result. Look for rust marks on the bottom of your breaker box, hot or warm breakers, lights flickering, partial loss of electric, cracked or frayed exterior service entrance cables, or an electrical or burning smell. These are all signs of water damage to your electrical service. Many times when adding additional load to an existing system, an upgrade is necessary. Such items include: hot tub, welder, air compressor, central A/C, solar PV, electric heat, electric stove, home addition, etc. 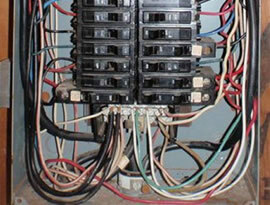 A full breaker box or tandem breakers often warrant a service replacement. Fuse boxes often contain improperly sized fuses! 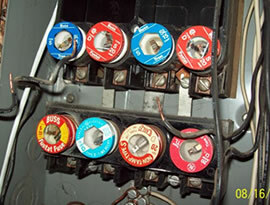 Blowing fuse problems are often “solved” by installing a higher rated fuse. This practice allows more current to flow through a wiring system that is not designed to handle these loads. (often two times more!) The risk of fire is greatly increased when this happens. 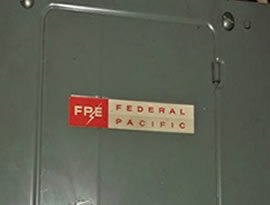 Federal Pacific breakers were widely installed from the 1950’s through the 1980’s. They are no longer in business due to numerous lawsuits. Because of a proven high defective rate, their circuit breakers failed to trip approximately 60% of the time when under overload or short circuit conditions. There is no practical way to test which breakers are defective internally. Given these facts, these panels are considered an undue fire and injury risk. We recommend replacing this equipment on sight! Zinsco stopped production of these panels in the mid-1970’s. The aluminum connections between bus bar and breaker are often loose. This causes arcing to occur and the aluminum bus bar is easily deteriorated, causing even more arcing and burning. Because of this serious design flaw, we also recommend replacing this equipment on sight. Many home owners’ insurance policies will give a discount for homes that have had their electric service replaced or upgraded. In some cases, insurances policies will not be written until they are upgraded! Usually this occurs when an existing home is being bought or sold. A third party home inspection is ordered and often the electric service is flagged for repair or replacement. This is usually a negotiation issue at the settlement table. D.C.E. works with many real estate agents in the area regarding this matter.